It's very likely you've drawn a diagram like this one at least once... (and I'll bet probably you do it very often). It is just a tipycal branch diagram, showing the relationships between branches, merges and labels (changesets are not normally displayed when you draw the diagram manually :-P). It clearly shows when a merge happened (from a project point of view) or when a label (and hence a baseline) was applied. The folks at Microsoft's Team System group are dreaming about releasing something similar in the future. The branch explorer released with Plastic 2.0 is all about representing branch evolution... the kind of stuff you'd usually draw on paper... but now rendered at your screen. 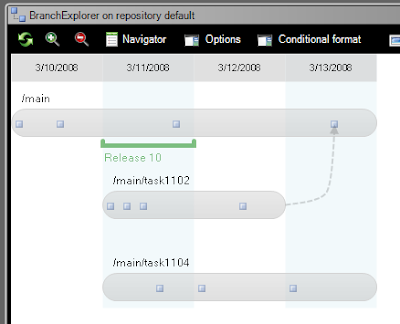 So, what I'll be showing is a quick tour through the branch explorer, and how an entire branching and merging cycle can run from it. Watch the entire tour here! Hey guys, are there plans for a Brazilian Portuguese translation of Plastic SCM? I really liked the way it handles branching/merging, but I can't recommend it unless there's a portuguese version available. Well, you know we've Spanish and English localizations right now, not yet Brazilian Portuguese I'm afraid. Depending on the number of users interested in a Plastic translation, we could order one... email us for details if you're interested.